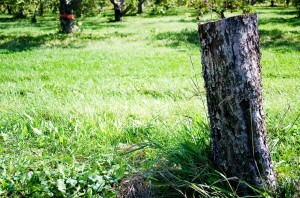 Thinking of removing a tree from your lot, house or area? It’s important to know the risks involved and why it’s important to hire a tree care expert when removing a tree. It’s a dangerous undertaking and removing a tree can potentially be hazardous to both you and your important investments. It’s easy to be injured by falling limbs, equipment failures, the tree itself, or by other obstacles that fall when the tree is being removed. We always recommend consulting a tree expert / arborist such as Advance Tree Care when removing trees in the Virginia Beach area or wherever. Incorrect Equipment – There’s many precautions that tree removal experts such as Advance Tree Care take to ensure the safety of all the people and structures in the area. Tree removal experts are fully trained to operate chain saws, ropes, cranes, wood chippers, and hoists to ensure that the tree falls properly, safely, and without damaging any near by structures. Decayed Wood – It’s hard to tell if a tree is decaying on the inside. All to often, many inexperienced home owners try to tackle removing a tree to find out the the middle of the tree is decaying and it isn’t a sturdy as originally thought which can be dangerous. The outside of a tree could look perfectly fine but as soon as the tree is cut into it’s revealed that the center is rotting or decaying. For this reason it’s highly suggested to call a professional tree removal expert. Gravity – Once a tree starts falling down it doesn’t stop until it hits the ground. All to often people think a tree is leaning one way or the other which can be wrong. A tree’s lean is very difficult to determine and tall trees can be more prone to falling in directions which were not expected which can often result in property damage or worse. Utilizing a tree removal expert is very important. Power Lines – Working near power lines is very dangerous. Someone removing a tree can’t assume that the wires are live or not. If you or your tools come in contact with the power lines then it’s possible to knock out the power of the neighborhood or to get electrocuted. Tree care professionals can use cranes to avoid power lines in risky situations. We encourage all people thinking of removing a tree on their property to call Advance Tree Care first. We can give you an estimate on costs, scope of the project, and we can help make sure you’re properly removing the tree. Visit our Virginia Beach tree removal page for more information about our process, our experience, and what we can do for you!